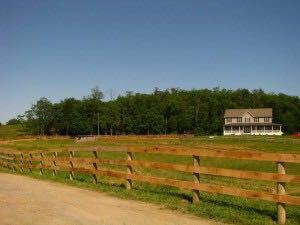 An attractive and effective way to keep your horses on your property is to have a board fence installed by ProFence. Board fencing for horses are a very popular option to not only keep horses on your property, but to enhance the look and value of your home. Choose from three different types of wood that will compliment your acreage. We use oak, treated southern yellow pine, and hemlock as these are all ideal for horse fencing. Our board fencing for horses typically have 15 years of service before maintenance may be needed. With proper maintenance, board fences for horses can last a lifetime. Board fences are viewed from a horses perspective as a solid barrier that they are not likely to challenge. Installing board fences for horses is a task that has been performed by ProFence hundreds of times over the years. We’ve installed wood board fences on every type of terrain and through or around all sorts of obstacles. If your board fence for horses is installed incorrectly, you may not even realize it until the fence begins to fail way before it should. At ProFence, our professional wood board fence installers will finish the job on time and within budget.